The Data Flow tab and workspace, where you build your data flows to extract and move data from data source objects, to data target objects. Arrows connect the objects and support the flow. The Flow tab, which enables you to set data flow properties, run flows, and arrange flow objects. The same tab is active when you create process flows. 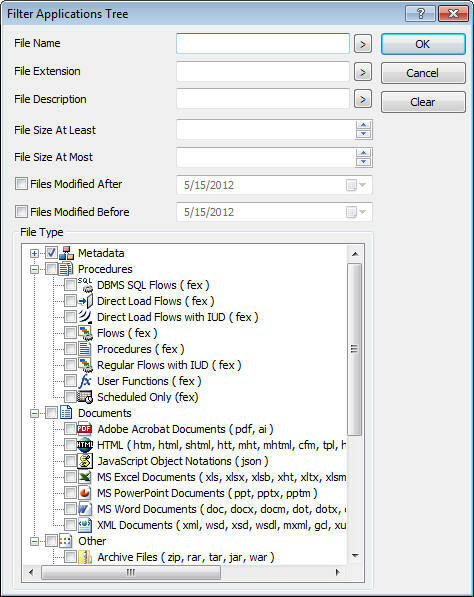 The Application Directories folder provides access to flows, procedures, and reports that can be generated from a flow. It also provides access to synonyms that describe data. You can use them as data sources or data targets in your flow. The Adapters folder allows you to add and configure adapters. The Workspace folder allows you to configure the server. As shown in the following image, when you create a new flow, the Data Flow tab opens by default, with an SQL object in the workspace to anchor the flow. By default, the Synonyms button in the navigation pane is active and ready for you to add data source objects. You can change this from the Options dialog box by deselecting the Automatically switch filters check box on the General page. The Flow tab is also active. You can add data source objects and data target objects, and use the SQL object to establish rules for extracting and moving data between them. For more information on the Data Flow Interface, see Working in the Data Management Console. On the Home tab, in the Filter group, clicking Procedures shows saved flows, procedures, and user functions. You can add flows and procedures to a process flow by dragging them from the navigation pane into the workspace. If you right-click a flow or a procedure, or highlight one and press the menu key , a shortcut menu opens, as seen in the following image. Places the flow or stored procedure in the workspace. Opens the code behind the flow in the workspace. Note: If you change the text behind the flow, those manual changes will be lost if you edit and resave the flow in the DMC. This option is only available for a flow. Submits the flow to the server. This option is only available for a flow. Log information is written to the DataMigrator Log. Runs the flow or stored procedure immediately. Log information appears in the console log window. Submit with E-Mail. Runs the flow or stored procedure. 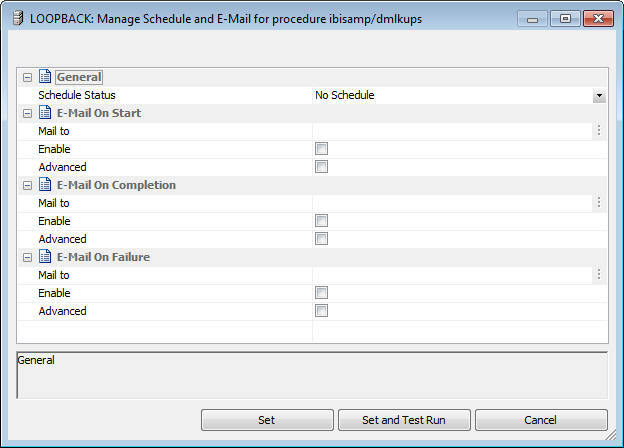 The Submit flow/procedure dialog box opens, as shown in the following image. Do not wait for completion. Allows you to continue your work as you wait for the submitted flow or stored procedure to complete. When this option is selected, an additional check box appears which allows you to specify that the flow or procedure should be run at a specified date and time. Submit changing defaults. Runs a procedure with a prompt to override default values for variables procedure or flow, then run it. Submit with Limits. This option is only available for DataMigrator flows, not stored procedures. Allows you to specify the start and end of the loading records. Sends an email when the procedure begins. Sends an email when the procedure completes. Only used if the procedure fails. Is the field where you enter the email address that the message is being sent to. On Completion or Failure, the email message will contain attachments of the log and output from the procedure, if there are any. Run Stress. Generates a script for scalability testing. For more information, see Server Administration for UNIX, Windows, OpenVMS, IBM i, and z/OS. Manage. 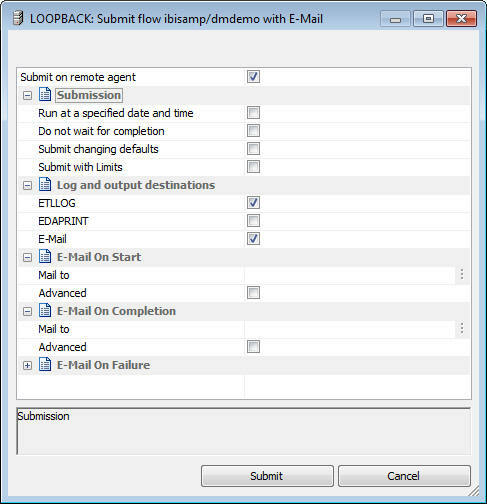 Allows the schedule and email notification settings for a flow or stored procedure to be changed without opening the flow, as seen in the following image. For more information about scheduler options, see Schedule Attribute Pane. For more information on email notifications, see Flow Properties Pane - Email Attribute. Scheduler Agents. This report runs for the user whose ID value is stored in the sched_scan_id of a Scheduler. The Scheduler must be active to run the Scheduler Agents report. Scheduled Events. 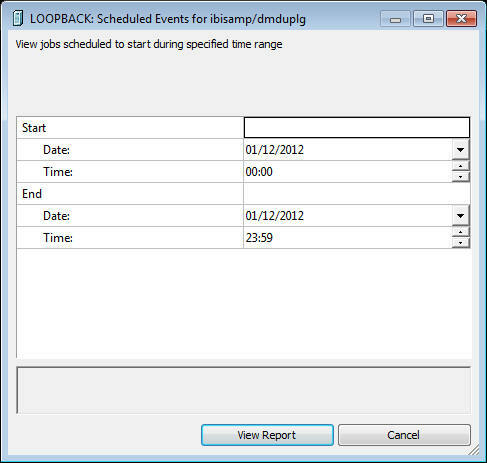 Opens a window that shows all jobs scheduled to run during a specified time range, as seen in the following image. The Scheduler must be active to run the Scheduler Events report. Last Log. Shows the last log available for the selected flow or stored procedure. Last Output. Shows the last output, if any, for the selected flow. Log and Statistics. 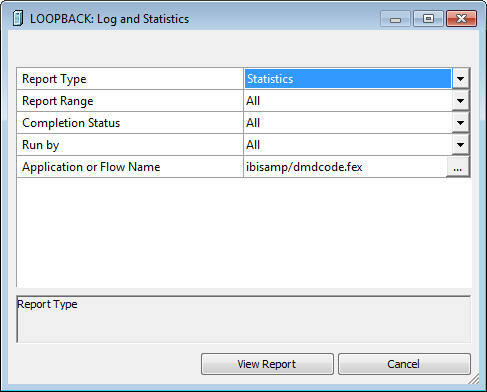 Opens the Log and Statistics dialog box that enables you to view a log or statistics report, as seen in the following image. Allows you to select either a log or statistics report. Allows you to select to view the last report, all the reports, or a report specified within a select time range. Allows you to view the log for all flows, all completed flows, all flows completed successfully, or all completed flows that contained errors. Allows you to view reports for all flows, including those initiated by the scheduler or submitted by the user. This includes flows initiated from the DMC, WC, and CMRUN. Opens a report that shows every flow or stored procedure that calls the selected flow. Opens a report that shows all synonyms used by the selected data flow and all flows and procedures used by the selected process flow. Provides a summary of the attributes of the flow. This option is only available for flows. Cuts, copies, deletes, or renames the flow or stored procedure. This option is only available if the server is started with security enabled. 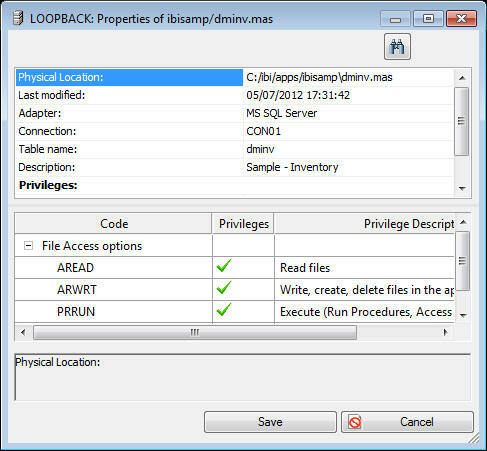 For more information, see Manage Privileges Dialog Box. Adds or checks files into source management. Checks files out of source management. Provides the source management history of a file. Opens a Properties dialog box of the selected flow or stored procedure. Right-click Application Directories or an individual application directory, select Schedule and E-mail, and then click Scheduler Agents. The Scheduler Agents for window opens, as shown in the following image. Select or deselect the check boxes for any flow you want to make active or inactive. Click Activate Selected or Deactivate Selected. On the Home tab, in the Filter group, click Synonyms to show synonyms that describe the data. You can use them as data sources or data targets in your flow. The synonym type is listed after its name. The type of synonyms available will depend on the adapters that are configured on your server. Opens the synonym in the workspace. The file, segments, and columns appear on the left, and their attributes and values appear on the right. Places the synonym code in the workspace where it can be edited. Places a relational synonym Access File in the workspace where it can be edited. This option is not available for FOCUS files. In WebFOCUS Developer Studio, this option enables you to create a business view of a synonym by limiting the columns available to any retrieval request that references the business view. Note: The use of Business Views as a source in DataMigrator is planned for a future release. Shows a sample of the data associated with the synonym. Shows the values for the selected synonym only. Shows a count of the number of rows in the selected source table. For a multi-segment synonym, it shows the count for each segment. Allows you to select the columns that you would like to analyze as potential keys to the source table. Refreshes the selected synonym. Updates the synonym with changed field information while preserving its old title, description, usage, DEFINE field, and DBA information. Deletes the data and recreates the underlying DBMS table of the synonym. Synonyms created in Release 7.7.04 or later include information about database indexes. Note: Use caution when using this command if the database table was created using the data description language of a particular RDBMS. Some attributes of relational database tables, including the column order and database constraints, are not reflected in the synonym, and therefore, cannot be recreated. Deletes the data from a synonym. This is useful to clear a synonym that will be used as a data target. Drops the underlying table from the database. Loads the synonym with sample records (for relational and flat file synonyms). You will be prompted for the number of sample records to load into the table. Note: If you are inserting sample data into a flat file, the synonym must contain a DATASET statement indicating where to put the data. Allows you to view and edit data in a database table. Creates a simple Data Flow that selects all rows and columns from a source table. Allows you to assess the impact of a change to the synonym on this server and any subservers that use it. Lists all flows, stored procedures, or reports using the synonym. For data flows, it will indicate whether the synonym is used as a source or a target. Flows and stored procedures are referred to generically as procedures. For a synonym that contains a cluster join or multiple tables, all synonyms directly referenced by the selected synonym will be shown. For more information regarding source management programs, see Source Management. Cuts, copies, deletes, or renames the synonym. Opens a Properties dialog box of the selected synonym, as shown in the following image. The Advanced command gives you finer control over the file types that appear in the navigation pane. For example, you could specify that you only want to see synonyms for the MS SQL Server tables. It also lets you restrict display to files with specified names (using wildcards) or descriptions, files modified in a specific time period, or those of a specified size.